Ready for a walk in the woods? 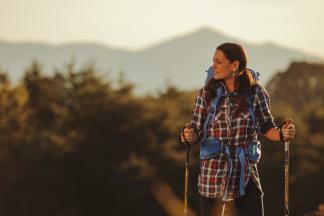 There are more than 600 miles of hiking trails in the Roanoke Valley in Virginia&apos;s Blue Ridge, including the Appalachian Trail, offering everything from easy strolls to challenging climbs. Come discover why Virginia&apos;s Blue Ridge was named "Best Trail Town" by Blue Ridge Outdoors Magazine! After all, we&apos;re always ready for a walk on the wild side in the Blue Ridge Mountains. You can experience the incredible views from the top of McAfee Knob or Sharp Top Mountain at the Peaks of Otter. Or, you can climb to the top of Roanoke on the Mill Mountain Star Trail, which leads to the Roanoke Star & Overlook, providing you the chance to look out over the Roanoke Valley. We also have great hiking opportunities at the State Parks in the region: Claytor Lake State Park, Fairy Stone State Park and Smith Mountain Lake State Park. With the variety of trails in Virginia&apos;s Blue Ridge, you have options for hiking to a summit that provides any type of view - city skyline, pristine waters of a lake, reservoir, waterfall or river, stunning mountain vistas, or the peaceful Virginia countryside. You&apos;ll have to experience it to truly believe it. To take on some of the region&apos;s best hiking, conquer the Triple Crown. Grab your pack and a camera. Between the trails, wildlife, and stunning views, there&apos;s no telling what will take your breath away. 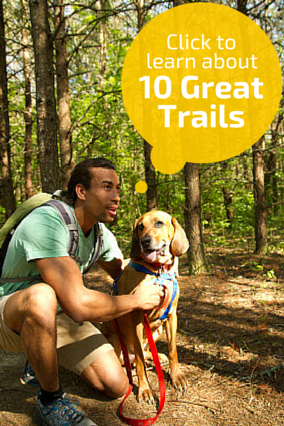 You can also check out our list of 10 Great Trails and see a complete list of hiking trails on the Blue Ridge Parkway in Virginia. The following is a list of hiking trails in the Roanoke Valley. 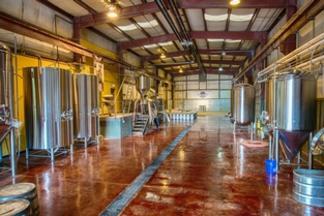 A culture that celebrates a craft beer industry that continues to grow through amazing local breweries. There's an adventure and experience for everyone in Virginia's Blue Ridge. Enjoy the ride. Choose your own path. Be a #trailsetter.